A TASB representative ran the meeting. Seat placement for Committee members was prearranged with name plates. 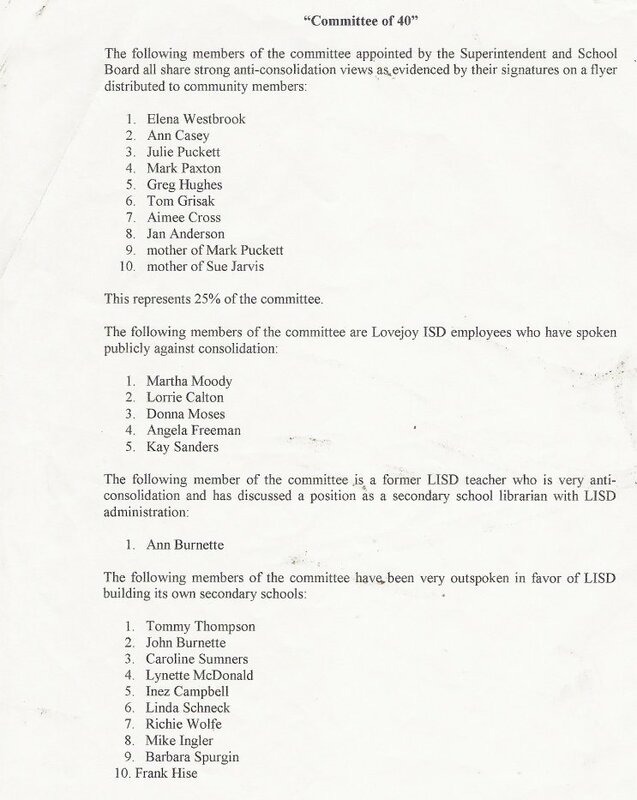 Only two committee members who were known to be against Lovejoy building secondary schools were appointed. 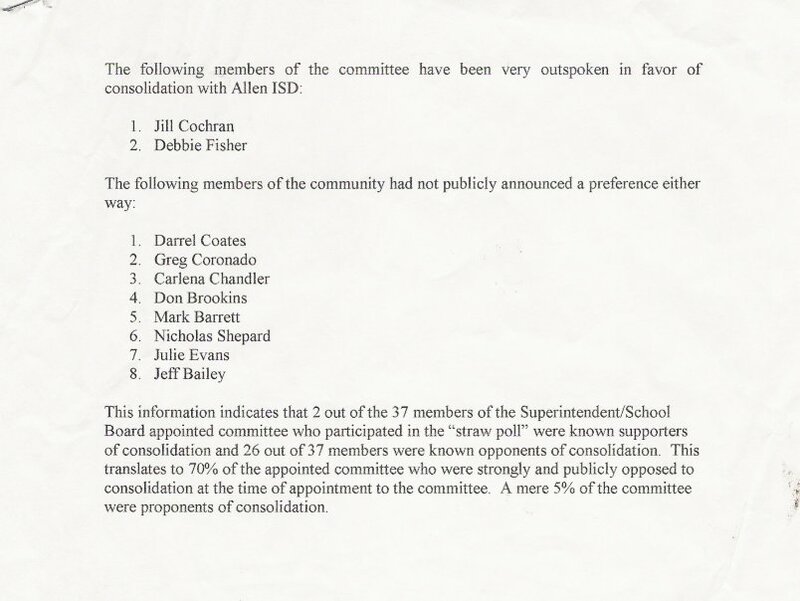 They were not initially appointed, but contacted board members and insisted on being placed on the committee. 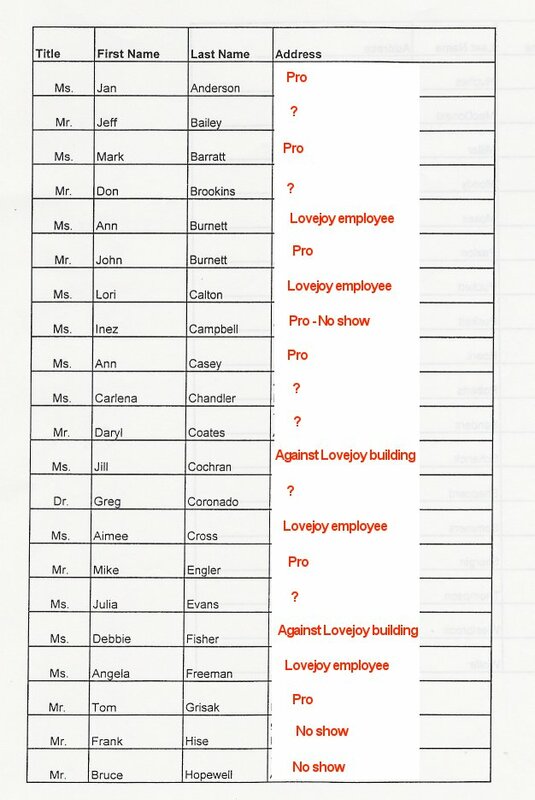 In contrast, the majority of appointees were pro Lovejoy building - twenty-six were known vocal supporters. 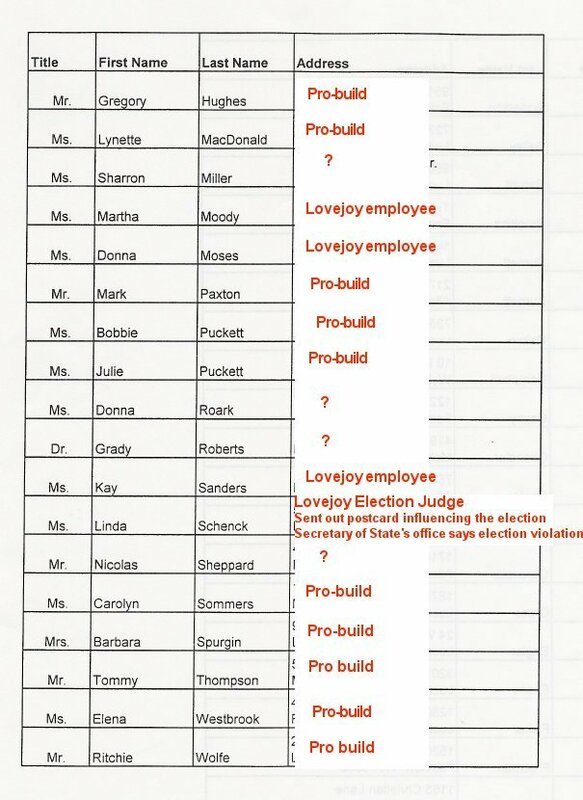 Sixteen known vocal supporters (pro) of Lovejoy building were selected and an additional 10 supporters who signed the back of a flyer distributed by current school board members, Elena Westbrook and Ann Casey. Three of these committee members are related, (brother, sister and her mother-in-law who is the mother of Lovejoy's new athletic director). This family sold the 70 acres to Lovejoy for the high school site and also own 150+ acres directly across the street. Unlike Lovejoy ISD, Lucas city meetings are tape recorded and are fairly detailed minutes AND ARE STILL ON THEIR WEB SITE. Discussion of "mixed use". Group activity was carefully controlled. There was no opportunity discuss issues in depth, especially finances. The Delphi technique was effectively utilized to control the final vote of this committee. In defense of some committee members, they probably had no idea the Delphi technique was being utilized..
"The method works. It is very effective with parents, teachers, school children, and any community group. The "targets" rarely, if ever, know that they are being manipulated. If they do suspect this is happening, they do not know how to end the process." Lovejoy's Election Judge was also on the Committee of 40. Forum Comments: Will the Committee of 40 Process be fair? to FORCE an election and buy time to get financial information out of the Lovejoy School Board. that citizens petitioned the Legislative Budget Board to require Lovejoy to provide..